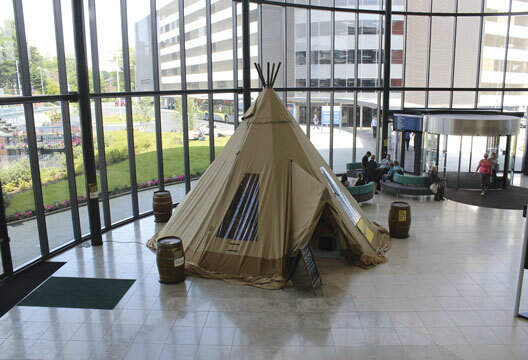 One lunchtime clinical psychologist Dr Nina Browne encountered a breast cancer surgeon sitting in a tepee at the entrance to Blackpool Victoria Hospital. After chatting with a bereaved mother, this surgeon had become reacquainted with the power of doctors, their words and diagnoses, and the true pain of their patients; this experience had changed her practice. This tepee, bedecked with fairy lights and comfy seats, was the brainchild of Sarah Mortimer, a Development Manager for the Association of Camerados, a social movement whose motto is ‘The answer to all our problems is each other’. Browne, works for fellow social enterprise Owls, whose vision is a world where anything is possible through collaboration and where communities are listened to and looked to for solutions. In partnership Browne had worked with Mortimer for the previous 18 months creating spaces in public environments which encourage people to connect. Mortimer said: ‘I spent quite a lot of time at the tepee – but people didn’t know I worked for Camerados. I’d sit in the Costa opposite watching people go in and out. The way I describe it is they were subconsciously leaving their lanyards at the door, they were all interacting as humans, not as consultant and patient, there weren’t the power dynamics of the wards and waiting rooms. That was the most powerful thing.’ Browne and Mortimer have received hundreds of postcards and emails from those who used the tepee and felt it was a powerful place. Camerados is hoping to expand the tepee concept and is on the hunt for eight partner hospitals in the NHS to test out more living rooms in hospitals. The organisation has also been experimenting with social eating in bringing communities together.